Make your Christmas season one to remember when you join UNCLE PETE and his trusty sidekick OXNARD for a world premier episode of THE DARK VAULT OF PUBLIC DOMAIN this Saturday night as they bring you the 1959 classic – SANTA CLAUS in the DARK VAULT OF PUBLIC DOMAIN CHRISTMAS SPECIAL – II. Made entirely in Mexico (where else would you make a movie about Santa Claus), this cinematic gem reveals some of the previously unknown secrets of Santa’s operation at the North Pole and how he manages to complete his annual trip, visiting the homes of all the world’s children. Meanwhile, UNCLE PETE and OXNARD are completing some experiments and observing a few DARK VAULT Christmas traditions at a remote research facility. Then it’s back to the DARK VAULT for the annual Boiler Room Christmas Party. Except, the research facility is so remote that UNCLE PETE isn’t sure how to get back there. So it’s up to the miraculous, infallible sniffer of the mighty OXNARD to lead them home and to the party. 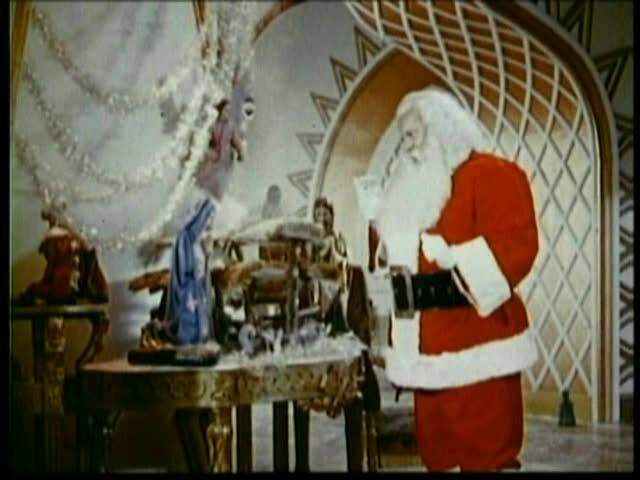 Along the way, UNCLE PETE digs up the first Rudolph The Red-Nosed Reindeer cartoon, some slick singing sisters with a little Winter Wonderland, a Christmas short with Paul Winchell and Jerry Mahoney and several other Christmas shorts and great toy commercials (including one for the niftiest mechanical hound dog ever!). There’s even some vintage footage of UNCLE PETE’s family (including his Mom, Dad, and brother) whooping it up in a Christmas of long ago . So join UNCLE PETE and his best friend OXNARD (in what has become her farewell appearance in a DARK VAULT episode) this Saturday night, December 21, 2013 from 10PM to midnight on channel 4. It’s THE DARK VAULT CHRISTMAS SPECIAL – II, featuring SANTA CLAUS! So make sure your chores are done and line up plenty of Christmas goodies. It’ll be one for the books and one to remember, and it’s our special gift to you from UNCLE PETE and OXNARD and everyone in THE DARK VAULT OF PUBLIC DOMAIN!!! ~ by UNCLE PETE on December 19, 2013.